The standard brass self-tapping Trisert® range has for many years included three primary designs: Double Ended, Reduced Headed and Regular Headed variants. These solve most application problems in thermoset and thermoplastic grades, including the latest engineering plastics. Trisert-3® is the latest addition to this family and has been developed to expand the proven Trisert® range into more critical applications including light metal alloys: aluminium, magnesium as well as glass-filled thermoplastics and epoxy / hard-glass thermosets possibly incorporating carbon & kevlar-fibre reinforcement. ONLY TAPPEX HAVE DESIGNED A SELF-TAPPING INSERT WITH BESPOKE CURVED CUTTING FEATURES – WATCH OUT FOR COPIES FROM ASIA AND THE UK! The concept of the Trisert-3® design is to provide efficient installation of threaded inserts into post-mould & machined parts especially as the installation torque can be more precisely controlled and monitored for greater reliability. 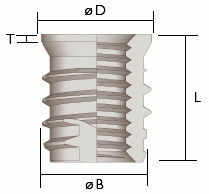 As the internal thread is used to install the Trisert-3®, with engagement in the installation tooling, all internal threads of each insert are automatically checked for the existence of a good thread. Trisert-3® has patented three cutting features to provide more balanced cutting forces and therefore reduced installation torque, compared to the many cross-slot designs available, that only have two cutting features (slots or pierce holes). The Trisert-3® design maintains a complete cylinder design that provides for a stronger body, size-for-size, than the slotted design and maybe used used in ‘pull-through’ applications. Trisert-3® is available in two standard-lengths variants: regular and long stated for length in mm. This provides an increased bearing surface that not only allows higher tightening torques to be applied, but also provides more support to softer mating components. 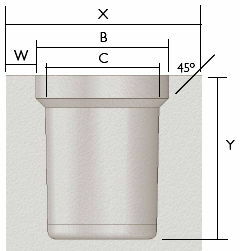 The head diameter is designed to fit exactly the counter bore of the the prepared hole specified, and thus presents a neat flush fit finish, where required. In most applications into plastic, the standard brass Trisert® offers a satisfactory and economic solution with good wear resistance and strength. Also it will withstand corrosion in most environments without any second operation surface treatment. In order to meet the requirements of a wider range of host materials and harsher applications, the selection of the material for the Trisert-3® is very important. Trisert-3® inserts are offered in two grades of stainless steel (303 and 316) as well as a case-hardened steel variant with zinc nickel, trivalent passivated finish. The stainless steel versions, in particular, are able to withstand critical operating environments, such as marine and chemical/food-processing, while still retaining good wear resistance and mechanical strength. The Tappex FlexiArm® provides a rapid and reliable method of installation for the Trisert-3® range. 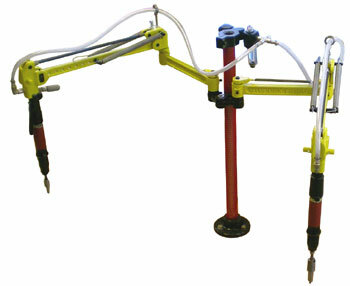 The FlexiArm® installation machine consists of a pantograph arm with a pneumatic screwdriver attached. The screwdriver can be specified with an automatic reverse torque-clutch control and operating at either 510 rpm or 1,100rpm. Alternatively, a manual reverse torque-clutch control operating at 510 rpm is available and will be recommended dependant upon the size of the insert and the material into which it is being installed. The FlexiArm® provides a low-cost assembly solution for many different post-mould applications and its size allows it to be installed alongside the respective moulding machine, so that inserts can be fitted during the waiting time of a typical mould cycle. It is available with one, two or three arms (which can be fitted at a later date) to suit most multi-task assembly requirements. With harder materials it is more critical that the insert is exactly aligned with the receiving hole. The latest FlexiArm® facilitates this by being adjustable in two planes or axis. A range of production drivers are available to provide an accurate method of installing the inserts at various heights and positions in the moulding (see inset), and they are available separately to suit M3 to M10 threads presently, larger sizes being developed and also some equivalent Imperial sizes are available. Alternatively, the inserts can be installed by hand, using Tappex Hand Tools (031 range) that come complete with an alignment bush to ensure correct installation. These materials are RoHS compliant. Finish: Self-Colour Passivated and as specified. Special finishes to customer requirements, at extra cost. Description: The Trisert-3 is a single ended self-tapping insert. Its main features are the truncated external thread form with three equally spaced cutting facets. Application: Designed to meet the the requirements of a wide range of host materials and harsh environments where brass Triserts would not be suitable. The Trisert-3 is compatible with the hole size for the equivalent size standard Trisert. Suitable in corrosive atmospheres and for installation into alloys or particularly hard engineering plastics. Hole Size: Moulded and drilled hole diameters vary dependent upon installation technique, specific component geometry and material. Please consult our technical department for a precise recommendation, to ensure optimum production conditions. Sizes given are for reference purposes only. The following are downloads relating to the Trisert-3® range, although a downloads may also be applicable to other product ranges. General information can be found on our downloads page. If you can’t find what you are looking for, please contact our experienced technical sales who available to assist you: +44 (0) 1789 206600.